Next week I am the guest speaker for the Peabody Area Chamber Lunch & Round Table and they have asked me to help their members find simple ways to get some traction, maximize visibility, and find the audience for their business or organization. In short, they are looking for ways to improve the time they spend on sites like Facebook, Linkedin, Twitter and Instagram to help them generate more business without buying advertisement. I could talk for days about this topic and I do offer one-on-one training for companies who want help with their Social Media Marketing, but if you are a local business looking to connect locally online you have to understand that social media is not a one way conversation and it requires time and commitment. Think of Social Media Engagement like a marriage engagement. Did your partner propose marriage to you on your first date? And, how long had you known your partner before you even got asked out on the first date? No one wants to go on a date with someone who they know nothing about and they certainly don’t want to say YES to a marriage proposal before they even have dessert so why do so many businesses think that the people who LIKE their company page on social sites will purchase their goods or services the first time they see a random post online? Most don’t! So, if you are using your social sites like an advertisement in the newspaper you most likely are not getting great success unless you are complimenting it with a strong supportive marketing and advertising campaign in the same geographical location. So, what is the solution to increasing social media engagement when you have no real marketing budget to advertise? Engage! Stop being the date at dinner who says nothing and start to ask questions to get a real dialogue going. Better yet, search for key social influencers in your market and connect with their company pages on popular social sites and link with them personally. A great way to get noticed is to notice others. Share the love! People always like and remember the person who takes the time to add a comment on a post they added to Facebook or Linkedin. And, if they read and share the company’s blog article or give a testimonial on their page they become a close alliance or key business contact. This is like giving compliments when you are dating. Who doesn’t like to be told they are both brilliant and beautiful?! The more positive attention you give, the better the results. Networking both online and off takes time, but it does lead to more business if it is done well. Want to learn more about how to increase your social media engagements and help your business to have a better 2017? 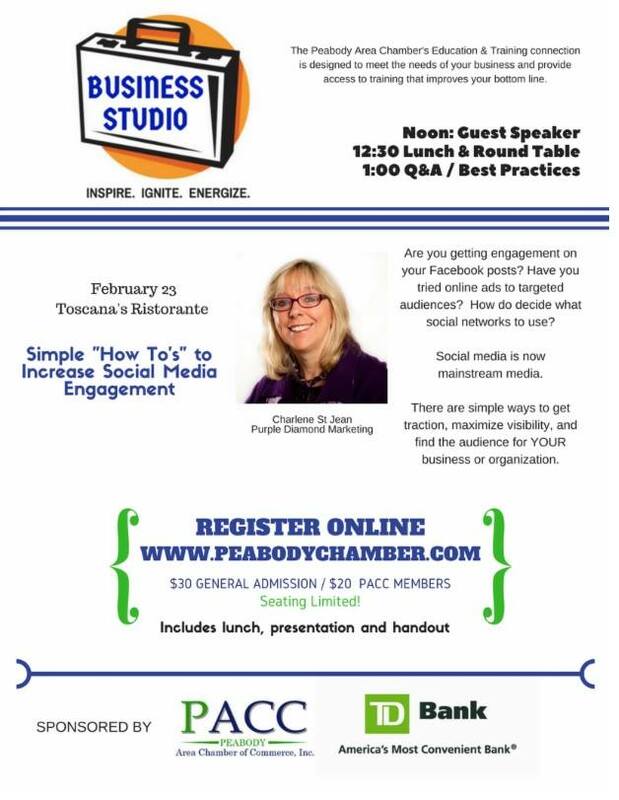 Attend my talk next week or schedule a social media one-on-one training with Purple Diamond LLC. Call 978-927-0626.